Trying to keep ahead of the snow. Annoyed that I'm warm inside. I'm always pleased that I don't have to shovel. I feel bad for my husband though, he can't catch a break this winter. Every time he tries to keep up with it, it snows again an hour later. 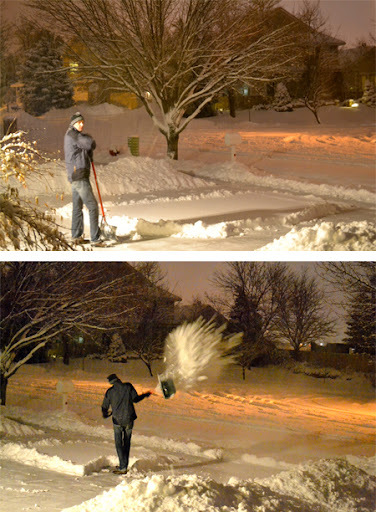 Yes, I'm glad I'm not the designated snow-shoveler! I definitely agree. I think my husband is looking forward to our kids being older so he can pass on the torch. I live in the Pacific Northwest and we still have not had any snow to speak of this year....I love it, but hate to drive in it! Just found you via Crafty Spices Wordless Wednesday Hop! Stop on by if you can. Oh, how would it be to not have this snow out there? I'm jealous! I agree, I love it on the ground (or just in the mountains is even better), but not on the roads. This has been the worst season ever. Thanks for dropping by! It's 73 here in SC today *brag* but I would love to see some snow! 73 sounds like heaven! The snow is beautiful and the kids love it, but I'm kind of over it for this season. Thanks for visiting! I'm in Florida, so I'd love to have some snow, even it that meant shoveling it! Trust me, the shoveling gets pretty old, pretty quickly (says the one who get's to stay inside.) I think I'm going to have to plan a trip to sunny Florida soon. Could use a change of pace. Thanks for the visit! Nice!! I'm from Dublin, but have just come back having been in Warsaw and -21 and LOTS of snow! As a matter of fact, my WW post is 1 pic from it! Your January weather has been awful! Growing up in all that, I now have to chuckle when Kansans start to freak out over a 2" snowfall. I hope you get a respite in February!